Jeanne Stevens is an amateur genealogist. Before retiring this year, she was also an AP US History teacher at Staples High School. So it was natural that when she learned about the condition of school founder Horace Staples’ grave — it, and those of his wife Charrey Crouch, son Capt. 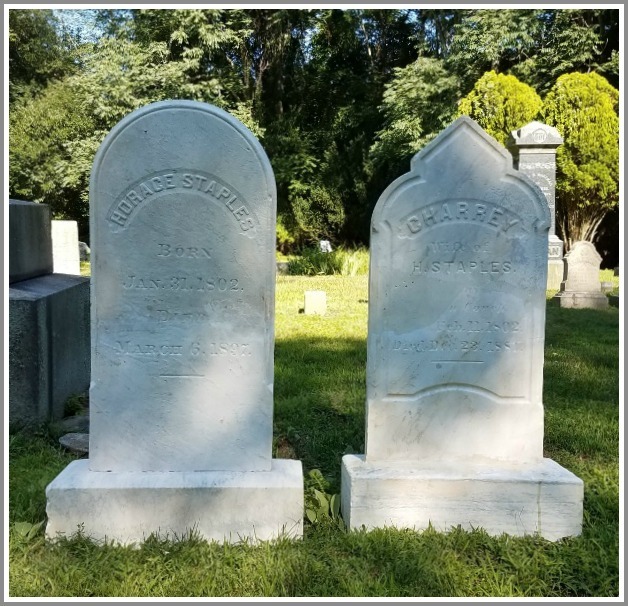 William Cowper Staples and daughter Mary were cracked, broken, knocked over, and overgrown with weeds and brush in Greens Farms Congregational Church’s cemetery — she vowed to help. The grave of the founder of Staples High School, before restoration. With the help of graduating classes and fellow teachers, she raised some of the funds. In August, Horace and Charrey’s stones were reinstalled. Meanwhile, in retirement, Stevens headed to the Connecticut State Library in Hartford. 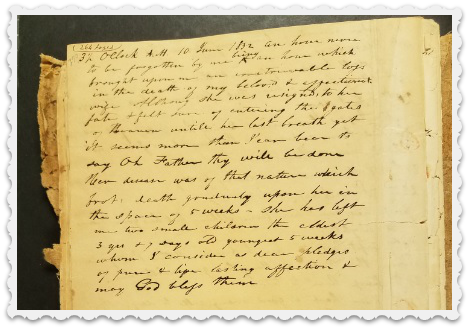 She had found a reference to the diary of Eliza Ann Hull Staples — Horace’s first wife — and wanted to see it. Eliza began writing when she was 14. The last entry was on May 5, 1832, 2 days before William was born and a few weeks before her own death. Horace Staples’ entry in his wife Eliza’s diary, after she died. 3 ½ OClock [sic] A.M. 10 June 1832 an hour never to be forgotten by me being an hour which brought upon me an irretrievable loss in the death of my beloved and affectionate wife. Although she was resigned to her fate & felt sure of entering the gates of Heaven until her last breath yet it seems more than I can bear to say Oh, Father thy will be done. Her disease was of that nature that brot [sic] death gradually upon her in the space of 5 weeks – she has left me 2 small children the eldest 3 years & 7 days old youngest 5 weeks whom I consider as dear pledges of pure and life lasting affection and may God bless them. A few years later, Horace Staples married Charrey. They enjoyed another half century together. 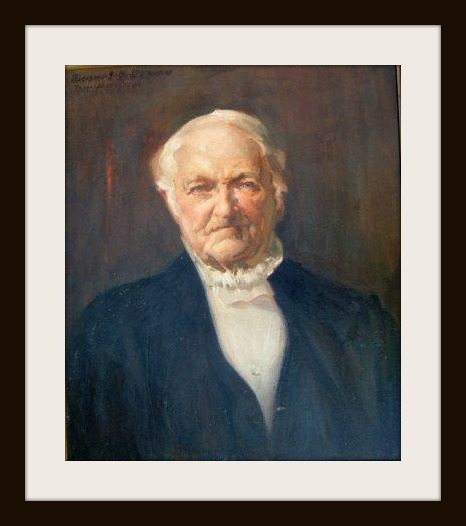 He became Westport’s wealthiest citizen, running a lumber and hardware business, and general store. He bought sailing vessels, a silk factory, and part of an axe factory. He owned a farm, a thriving pier on the Saugatuck River and helped found a bank. In 1884 — well into his 80s — he established Staples High School. He lived another 13 years. He died in 1897 in his Riverside Avenue home — age 96 — of pneumonia. His house still stands. Now — restored once again — so does his grave. This entry was posted in History, People, religion, Staples HS and tagged Charry Staples, Eliza Staples, Greens Farms Congregational Church cemetery, Horace Staples, Jeanne Stevens. Bookmark the permalink. Awesome story, perfect example of the class and history of this town and its residents. Don’t know whether your comment refers to the energy and generosity of Horace Staples or – 150 years later – of Jeanne Stevens. But in both cases, I agree with you wholeheartedly! Brava, and thank you, Ms. Stevens! And kudos to the individuals who did the miraculous restoration as well. I’m sorry that I didn’t know about the effort to raise funds before now – and I imagine that Dan wrote about it at some point – but if more is needed, or perhaps even towards upkeep, please let us know. As a Westport native who graduated from Staples, as did my parents and brother and my entire family, I applaud this accomplishment. Yes, we do still need funds! Daughter Mary Eveline’s stone is broken in 5 pieces, but is still legible. Son William Cowper’s stone is lying flat in 2 pieces. Donations can be sent to Staples High School, c/o Cemetery Fund, 70 North Ave. or contact me directly at m.jeanne.stevens@gmail.com. I saw Horace Staples’ stone in its restoration process in June while looking for a stone for my mother. The monument company told us the challenges of fixing the family’s’ stones. Each one was different. The diary find and entries are so interesting. Great research Jeanne Stevens and thanks for sharing! History is where it’s at. Discovering our past helps us understand the context of our lives.Thank you Jeanne, you are awesome. Love the diary entry.. which makes me look at Horace in an entirely new light. Do we know what happened to Horace’s kids from his first wife? Horace Staples’ g-son William G Staples (b. 1859) is shown living on State Street in Westport and married to Mary Staples in the 1910 census with three children: Horace W. (b. 1884), Mary C. (b. 1887), Helen H. (b. 1896). How very cool, Jack. I am half expecting some 06880 reader to say.. he was my ggg grandfather. yes, Horace Staples appears to have a good number of descendants – these would be g-g-g-grandchildren at this point – perhaps some are in the area. I don’t think there are any descendants in the area, but perhaps. The great grandchildren that I had tracked are all deceased. Yes, we do know about Horace’s children and you have the lineage correct. Mary Eveline never married. William Cowper did marry but had only one child, William Gray. His daughter Helen Huntington was the one who was in possession of Eliza’s diary and donated it to the CT State Library. 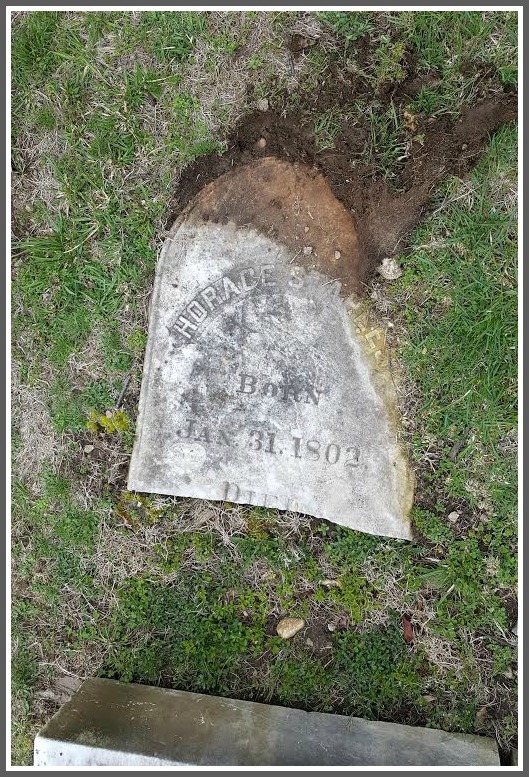 Appreciative thank you to Jeanne Stevens and the other supporters who helped restore the Staples’ gravestones – Horace Staples’ name lives on with our high school, but his importance to our Town is greater than that. Of course, I also really enjoyed the related genealogical info and artifacts – great finds. a wonderful Westport story, thanks…. Fantastic look at our namesake and founder’s life. Whoa. 96! in the late 1800’s Those are some great genes. Thank you Jeanne for taking this on. tombstone of Ebenezer Platt and several other historic figures. It’s a noble thing to do and will be appreciated for generations. What a class act. Well done, Jeanne. Please contact me I am a direct descendent.